Below you’ll find our picks for best overall laptop, as well as the best MacBook for Apple die-hards, the best Chromebook for those who desire an affordable laptop with a super-light OS, and the best budget laptops. We’ve also selected the best 15-inch laptop, best 2-in-1, and the best gaming laptop. To check out in-depth reviews of all the latest laptops head over to our laptop reviews. The Dell XPS 13 has been our favorite laptop for years now, but it always came with a caveat. The webcam position. We always thought it was worth the sacrifice for most people, but for those that depend on a webcam for video conferencing, it was an issue. In the 2019 version, Dell has fixed that. By engineering a smaller webcam, the company has managed to squeeze it in into the top bezel without growing much at all. That means the XPS 13 keeps its fantastic, thin-bezel design we’ve always loved — but now without any of the trade-off. The thin bezel design is as functional as it is beautiful, making the overall footprint of the system smaller and lighter. Does that make the XPS 13 too small? Nope. The touchpad is still as large as the competition and the keyboard is a breeze to use. The system is also energy efficient with a respectable battery size, so it can last all day on a charge in most situations and handle pretty much anything you throw at it. The same goes for performance, where Dell’s thermal solution continues to push its Intel Core Whiskey Lake CPUs to new heights. The best part? It’s a relatively affordable laptop with a cheaper entry-level option than its competitors, starting at just $900. All the same, you can still spec it up to 2TB of solid-state storage and a beautiful 4K touchscreen if your heart so desires. Why should you buy this: You need MacOS, and Windows just won’t cut it. No, the new MacBook Air isn’t the most powerful Mac laptop — that’s the 15-inch MacBook Pro with a discrete graphics card. It’s not the thinnest and lightest either — that’s the 12-inch MacBook. Even its screen, though technically “Retina,” isn’t as bright and colorful as these other options. However, what the latest iteration MacBook Air does offer is the most well-rounded Mac experience. It’s relatively thin and light, has the useful Touch ID sensor, and the best battery life of your Mac options. It also shares the same keyboard and excellent trackpad of the MacBook Pro. Apple finally has an entry-level laptop that isn’t a terrible value or hopelessly outdated. It’s not that $1,200 is a cheap price for laptop. It’s not. You can find better performance in a handful of premium Windows 10 laptops. But if you’re looking specifically for a MacBook (as many people are), you’ll be happy you picked up the MacBook Air. Why should you buy this: You want an inexpensive, but well-built 2-in-1. The Chromebook x2 is the first of a new wave of innovative and premium Chromebook form factors, as a detachable tablet in the Microsoft Surface Book 2 mold. That is, the lovely and well-built “Ceramic White” slate portion, which holds all of the actual PC components, slots into magnetic tabs on a relatively heavy keyboard base. That creates a clamshell notebook that is stable on the lap (with just a little wobble) while serving in movie mode with the display reversed and as a stand-alone tablet for pen use and media consumption. Based around a 12.3-inch IPS display running at 2,400 x 1,600 or 235 PPI and sporting the productivity-friendly 3:2 aspect ratio, the Chromebook x2 incorporates a 7th-generation Intel Core m3-7Y30 CPU, 4GB of RAM, and 32GB of eMMC storage. Those components are plenty fast for Chrome OS, and the Chromebook x2 takes full advantage. As icing on the top, the 48 watt-hour battery keeps the 2-in-1 going for a full workday — and then some. Chrome OS, which is designed around Google’s Chrome web browser, is wonderfully simple and intuitive. While it used to only run extensions and web apps, that has been expanded to now include everything in the Google Play Store, which fills in some of the holes and expands your selection of apps and games. If you’re not sure about laptops-as-tablets though, the Surface Pro 6 is the one to change your mind. First and foremost, it’s a stylish, lightweight, and powerful tablet that pulls double duty as a laptop. Worried about the Surface Pro as a laptop replacement? Think of it as a laptop with a detachable keyboard. Seriously, this thing has the power to do anything you need a laptop to do and more. The newest Surface Pro 6 has the same great design, only with faster internals and better battery life. No matter which configuration you choose, you now get an 8th-gen Kaby Lake processor under the hood — our review unit was sent over with a Core i5 inside. The Surface Pro performed well enough in our benchmarks for typical productivity tasks, and it remains excellent as an everyday workhorse. It’s quick, snappy, and versatile, everything you could want out of an ultra-portable laptop — plus it’s the best tablet around when you need it to be. In addition, the smaller, $400 Surface Go provides an interesting alternative to the Pro 6 if you’re on a tighter budget. If you don’t want to pay the full price of a laptop like the Dell XPS 13 or Huawei MateBook X Pro, then we suggest the Asus ZenBook 13 UX333. 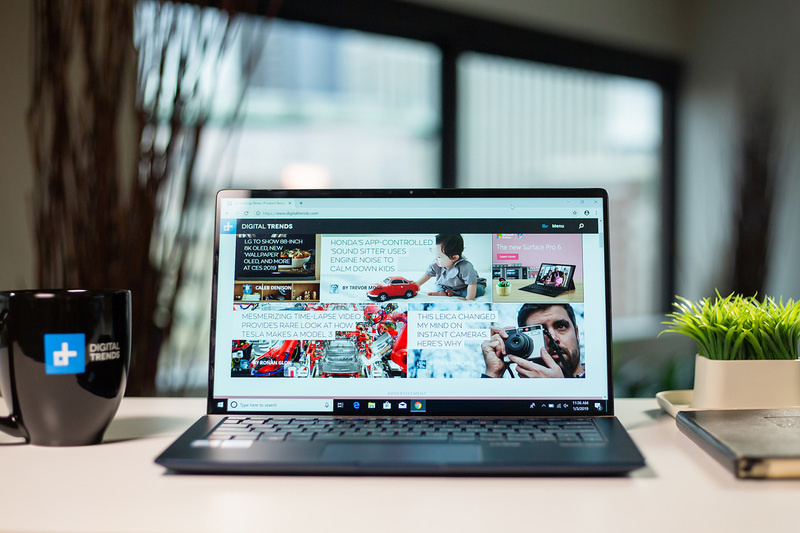 It’s an ultrabook that comes highly recommended from us and costs just $850. While most laptops in this price range cut important things like battery life or display quality, this ZenBook 13 has it all. It’s not as powerful as the Dell XPS 13 or a MacBook Pro, but in its most recent iteration it almost matches the XPS 13 in terms of its tiny bezels. It’s also a great looking laptop that keeps things light and thin without sacrificing build quality. The bang-for-your-buck value here is particularly impressive. The base model comes with an 8th-gen Intel Core i5 processor, 8GB of RAM, and a 256GB solid-state drive. That’s twice the memory and storage of the $900 Dell XPS 13 — and better battery life than what you’ll find in other competitors. Though you can still buy the UX331UA, the newest version has thinner bezels, a lighter chassis, and improved battery life in web browsing. It’s really remarkable how much laptop you can get for so little money. Who’s it for: People who want a fantastic laptop that can also game. From the exterior, you might not even know the Razer Blade is a gaming laptop. It’s as light and thin as a MacBook Pro, with thin bezels, a world-class keyboard and touchpad, as well as a bright, vivid, 15-inch display. Even if it weren’t a gaming laptop, the Razer Blade would probably still be a contender for one of the best 15-inch laptops. The fact that it can play games at respectable framerates makes it a bit of a miracle. With new RTX Max-Q graphics, maxing out all the way at the 2080, and a 144Hz refresh rate display, the Razer Blade is a killer gaming machine. The Razer Blade made short work of just about everything we threw at it — as long as you stay away from 4K, of course. Razer redesigned its thermal system to ensure that despite some throttling, the Blade can play nearly any game with settings maxed. That includes heavy loads like Assassin’s Creed: Odyssey and Battlefield V.
Simply put, this is the most elegant, beautiful gaming laptop you’ve ever seen. Options like the Asus ROG Zephyrus S might perform better, but for our money, this is the gaming laptop we’d choose every time. With the graphics added as advanced as the RTX 2080 Max-Q graphics, the 2019 is more powerful than ever. Who’s it for: Power users and those who want a big, beautiful display. The XPS 13 is great, but you may want something with a larger display. You’re not alone. Sales figures have continually shown 15-inch systems beating their smaller rivals. We think this is partially because good, small laptops aren’t cheap — but also because some people just want a bigger display. Fortunately, Dell also has the XPS 15. It’s great for all the same reasons as the XPS 13, and because it’s larger, it can be optioned with the fastest hardware available today — up to a blazing-fast six-core 8th-gen Intel Core i7-8750H processor, Nvidia GeForce GTX 1050 Ti graphics, a beautiful display, and fantastic battery life. It’s easily the best all-around 15-inch laptop on the market today. The XPS 15 was recently refreshed with the fastest 8th-gen processors, as well as with a more powerful GTX 1050 Ti in the higher-end configurations. These new components make the XPS 15 an even better value.